Admittedly, I am a spring gardener and even this month’s welcoming mild temperatures and mostly sunny days have done little to reignite my interest in gardening for this year; however, after an uninspiringly hot, dry summer followed by several weeks of rainy deluges in early autumn, November has ushered in a calming, peaceful charm to my little garden. After a couple of light frosts touched the plants, some of the more delicate specimens quickly retreated. Overall there is still a generous amount of green, but Hydrangea macrophylla offers an embarrassed blush, having never flowered this year. 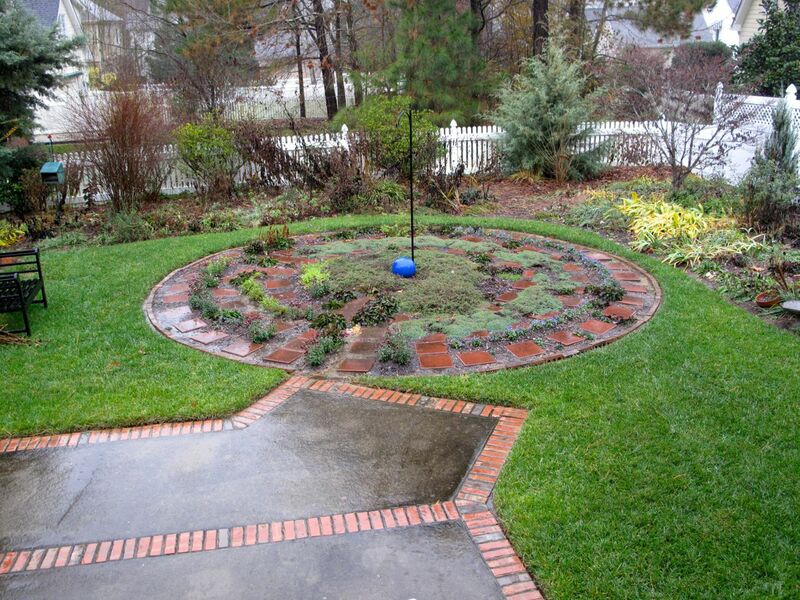 Artemisia in the side garden retains much of its integrity. Anemone coronaria had a fine blooming season this spring and early summer, then it completely died back. It has achieved fresh new foliage in the past month or so. Iberis did not bloom well this year, but the green leaves have revived. Achillea is extremely aggressive but I like its fern-like foliage. Planted in late spring this shade-loving Aucuba japonica ‘Variegata’ (Gold Dust Aucuba) survived the tough summer and is now forming berries. Also in the shade nearby, the ever-so-slow-growing Sarcococca ruscifolia (Fragrant Sweet Box) sports dark green foliage. 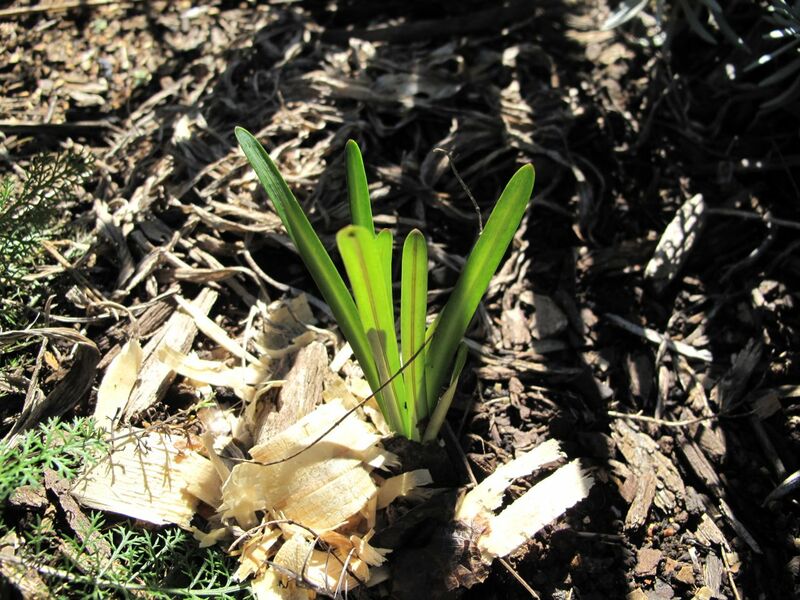 In several places Daffodils are emerging. I used to worry about this odd behavior but they always manage. Foliage of Euphorbia ‘Ascot Rainbow’ adds nice texture and color to the border. Only a few leaves at the top of the plant suggest a rainbow. I have not grown this plant before so perhaps it will continue to develop richer colors in the leaves, but the variegation is already quite nice. 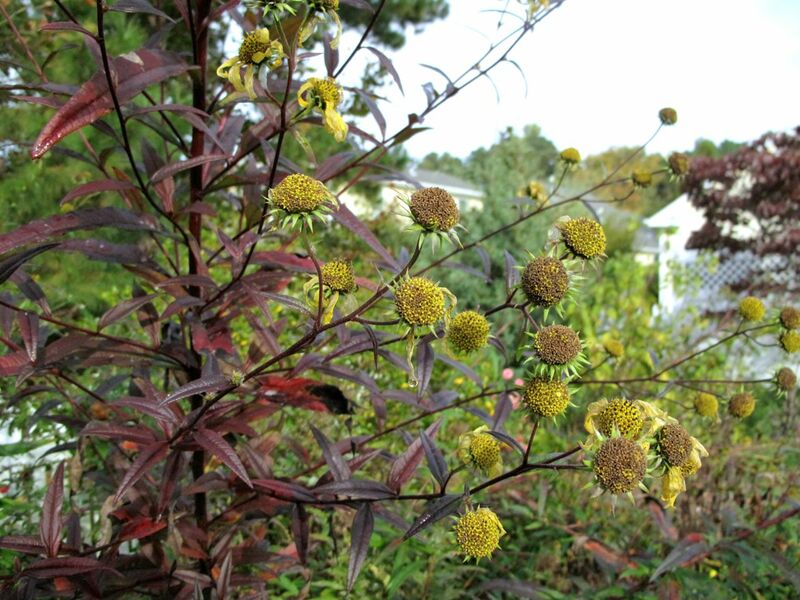 A few branches of Helianthus angustifolius (Swamp Sunflower) display red leaves, but most have simply turned brown. 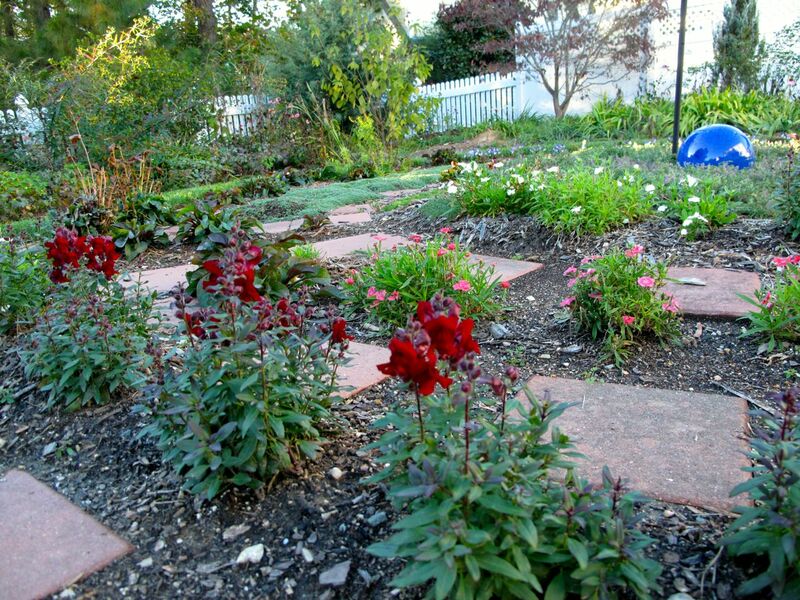 I moved a lot of Penstemon digitalis ‘Husker Red’ out of the meditation circle and into the borders. There are plenty of fresh gray-green leaves of Stachys byzantina (Lamb’s Ear) around the garden. 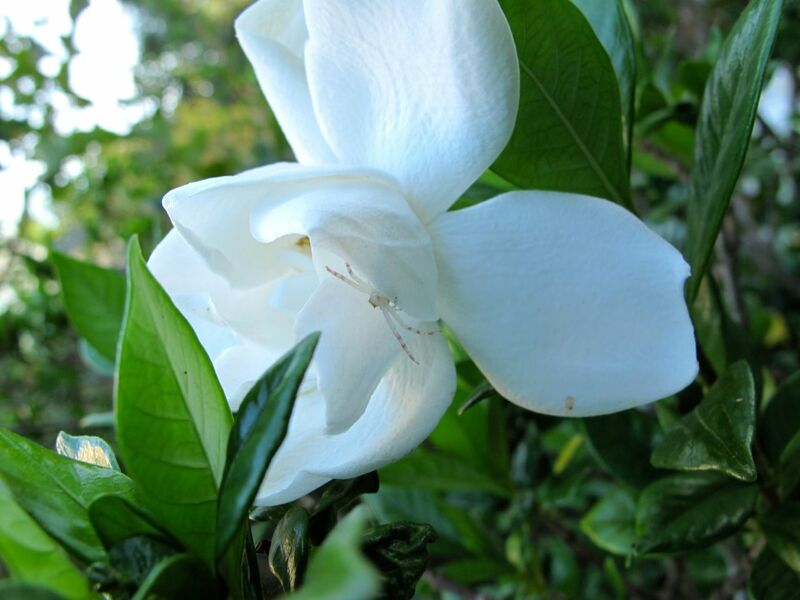 Yesterday I planted three Gardenia jasminoides (cape jasmine) purchased from a farmers market vendor. The leaves on these species gardenias are much larger, thinner and less glossy than my other gardenias. 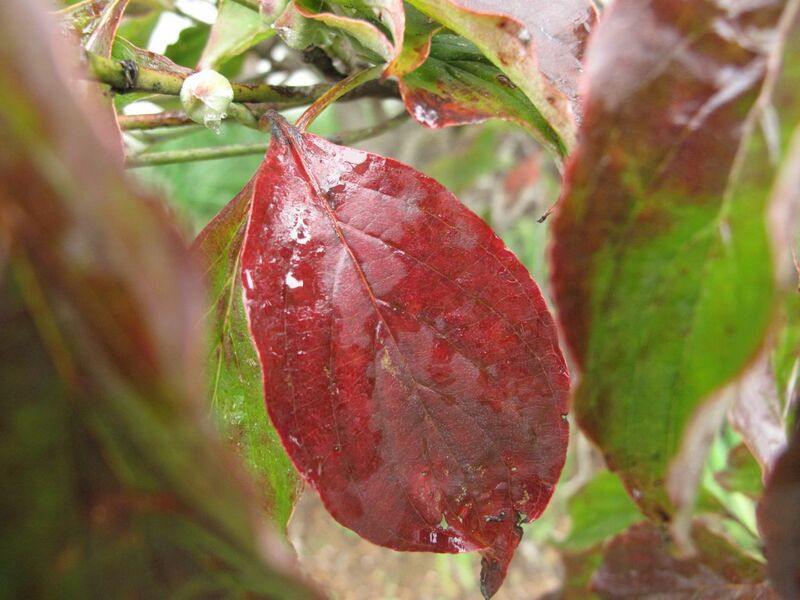 This entry was posted in garden and tagged Garden Bloggers Foliage Day, GBFD, late fall garden on November 22, 2015 by pbmgarden. Thyme in the meditation circle was dressed in white in the chill of early morning. Soon petals, leaves and berries glistened as sunlight reached the garden. By 1:00 p.m. the afternoon was sunny and mild at 62°F. (17°C. ), perfect weather for planting some new gardenias I bought at the State Farmers Market in Raleigh last week. I bought three old-fashioned Gardenia jasminoides (cape jasmine), but now am second-guessing whether they will be cold hardy. 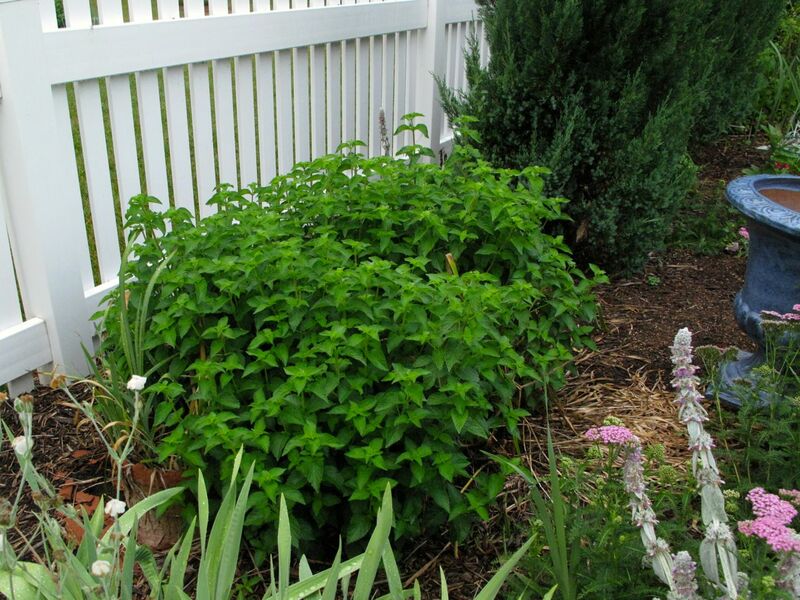 This entry was posted in garden and tagged angelonia, Gardenia jasminoides (cape jasmine), late fall garden, meditation circle, Thymus serpyllum 'Pink Chintz' (Pink chintz thyme) on November 15, 2015 by pbmgarden. 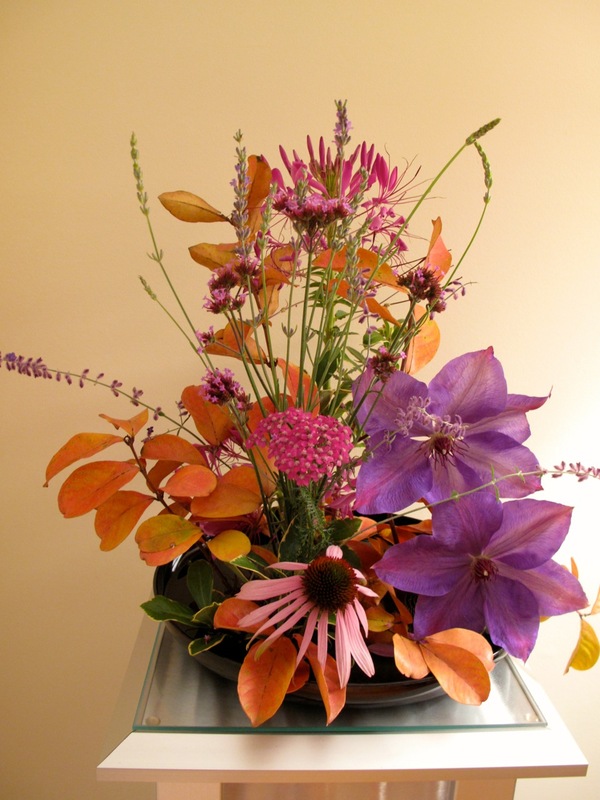 Busy with family events this week I missed making a Monday vase and am behind reading favorite garden blogs. But I prepared this entry ahead so I could stay in touch and complete the last exercise in this 3-part review. 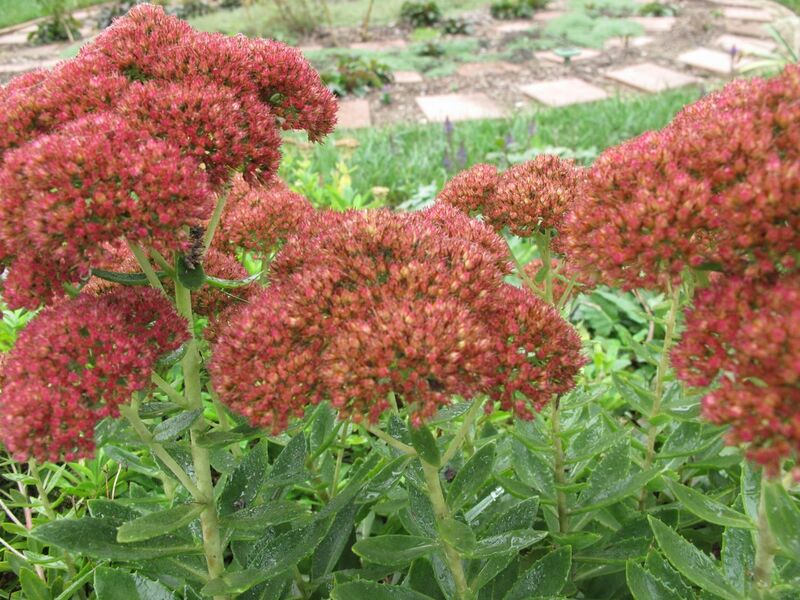 As the days grow short and we head toward winter, I have been finding cheer and smiles through a 2014 garden review project suggested by Cathy at Words and Herbs. 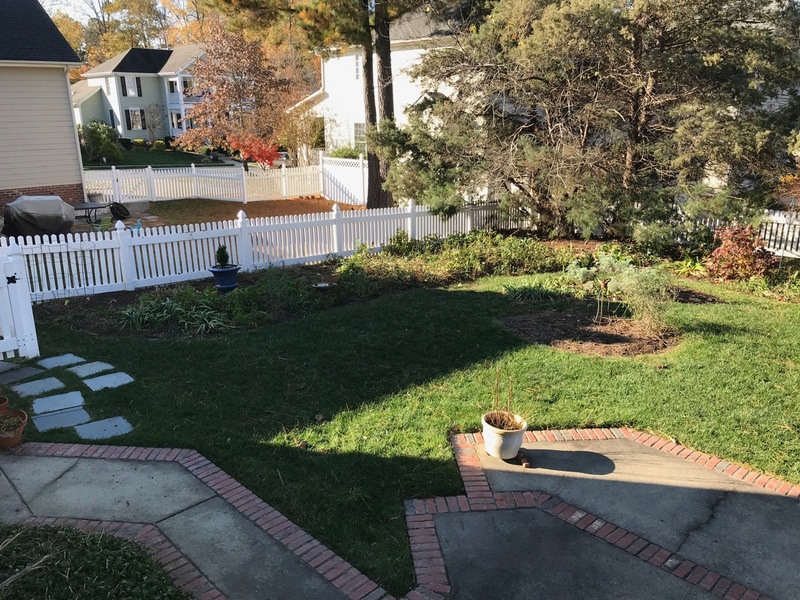 In the past two weeks I revisited my Spring and Summer gardens. For the last installment of this project, I have selected some things to share from Late Summer and Autumn. It is amazing to watch certain plants awake each year to achieve great size and presence in the landscape. 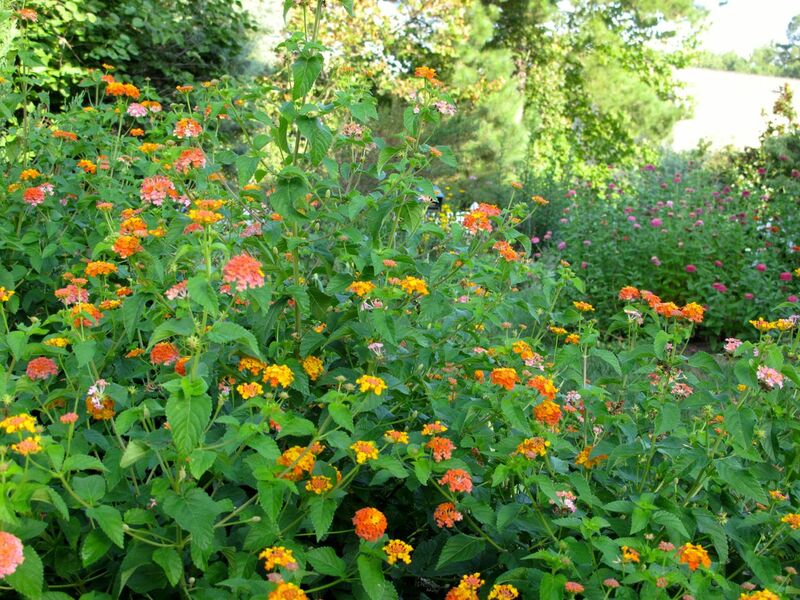 At mid-June, a full two weeks before the first flowers opened, Lantana camara (Common lantana) was merely a round clump of greenery, but once blooming it began attracting insects and hummingbirds. 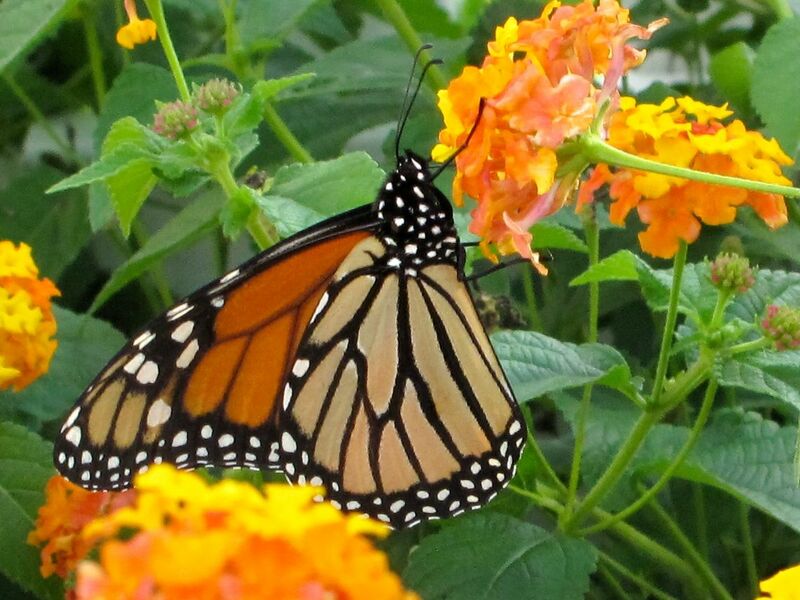 By Early September lantana fully dominated its corner of the southern border in color and mass. 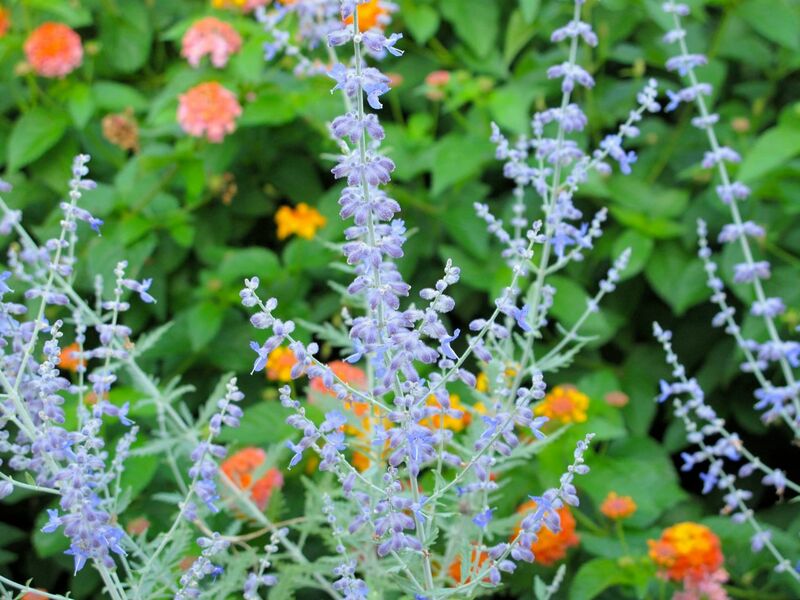 Tucked nearby blue Perovskia atriplicifolia (Russian Sage) looked stronger than usual this year. 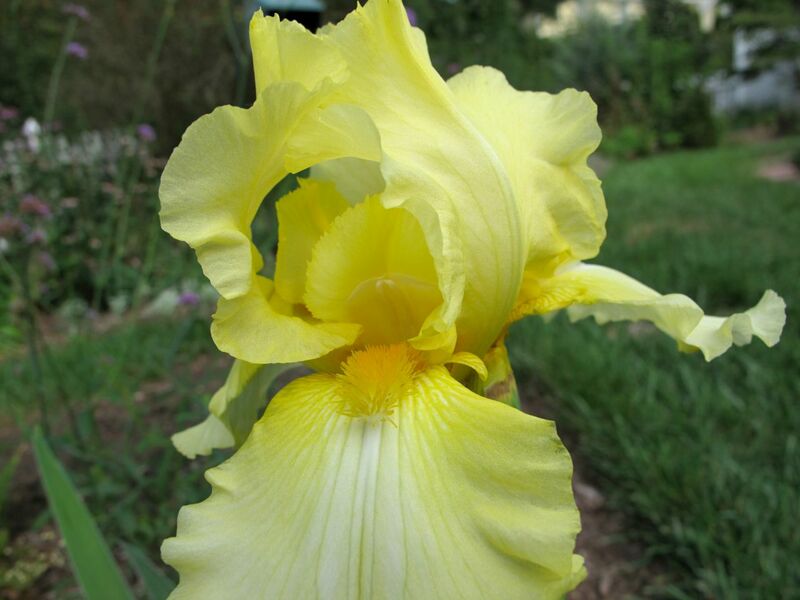 A yellow passalong iris began flowering again in early September and continued through October. By mid-month a few more Chuck Hayes gardenias flowered. 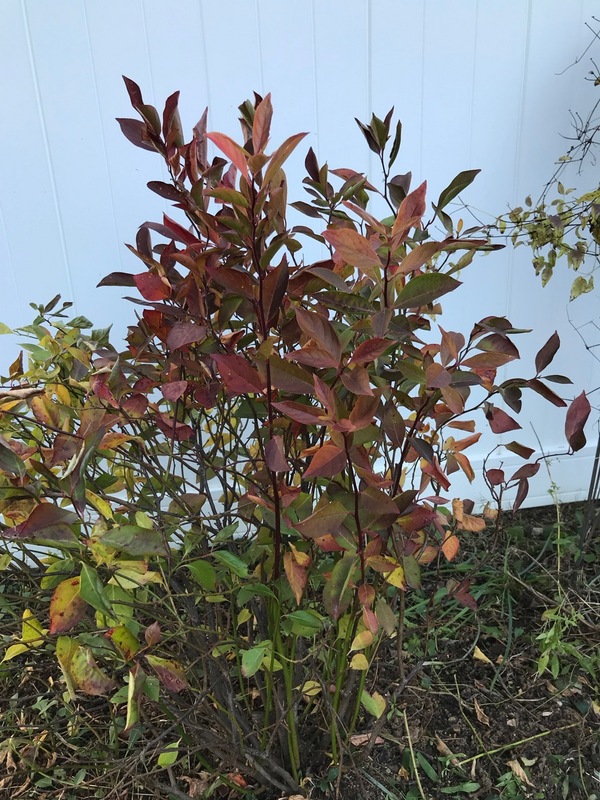 Unfortunately the shrubs never regained their vigor this year so they are on a long list of things that need attention. September temperatures were still hot. Autumn officially arrived on September 22 and the day before had been almost 90°F/32°C. 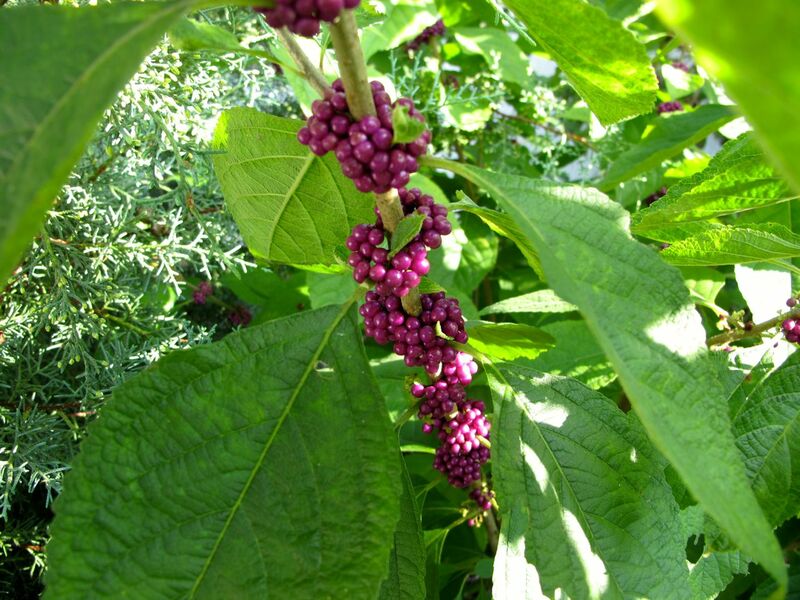 The garden was still very green and Callicarpa americana (American beautyberry) was full of those funky-colored purple berries. 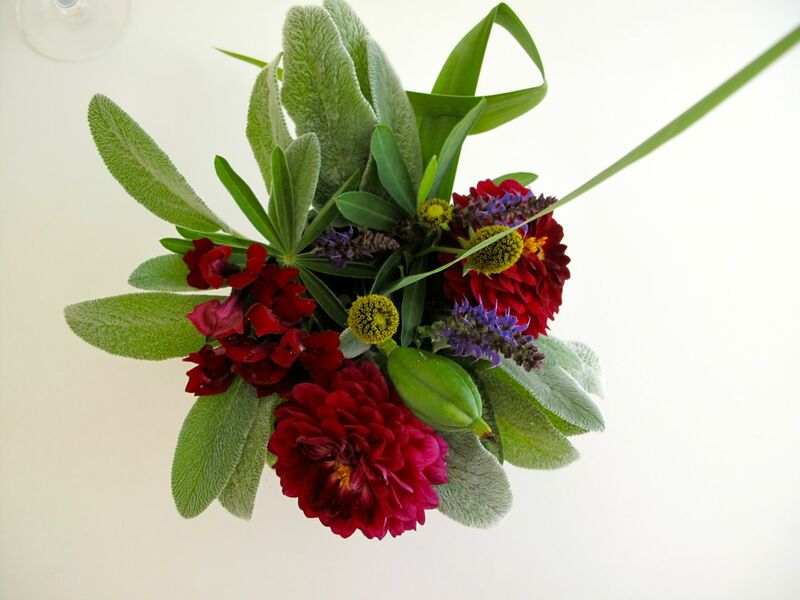 In September the search to fill a vase each Monday kept me more in tune with the garden than normal and I began during this time to gravitate back to the garden, appreciating its varied offerings. 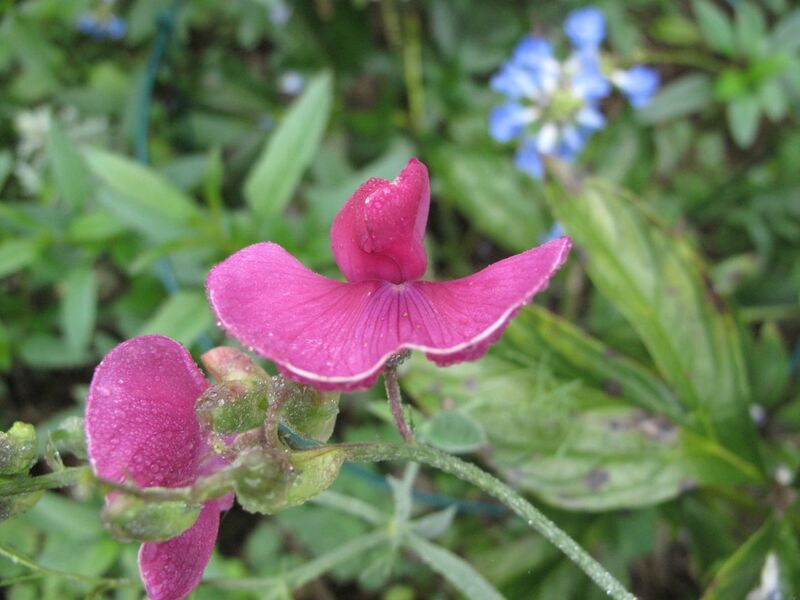 Meanwhile Everlasting Sweet Pea rebloomed better than it had in spring and Obedient Plant was in its prime. 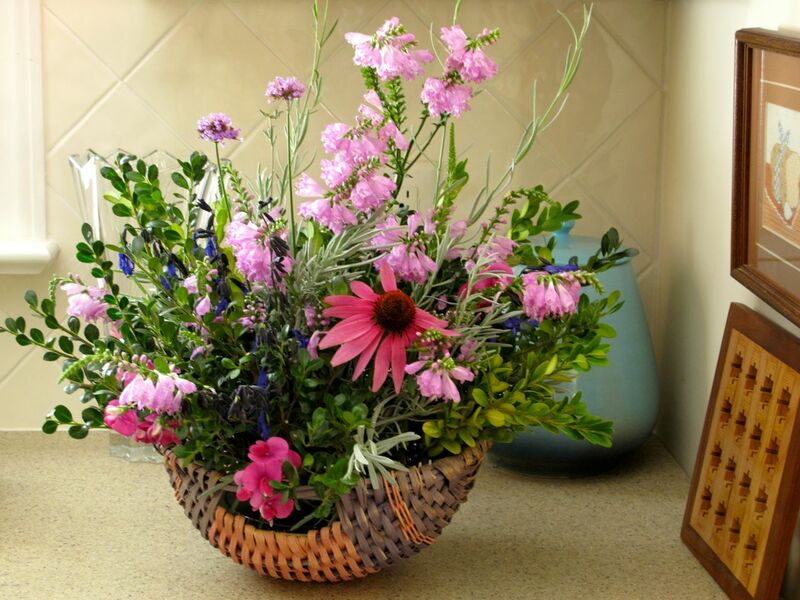 Occasionally I found a few fresh blooms of Echinacea around the garden to include in a vase, but most of them looked rather tired. 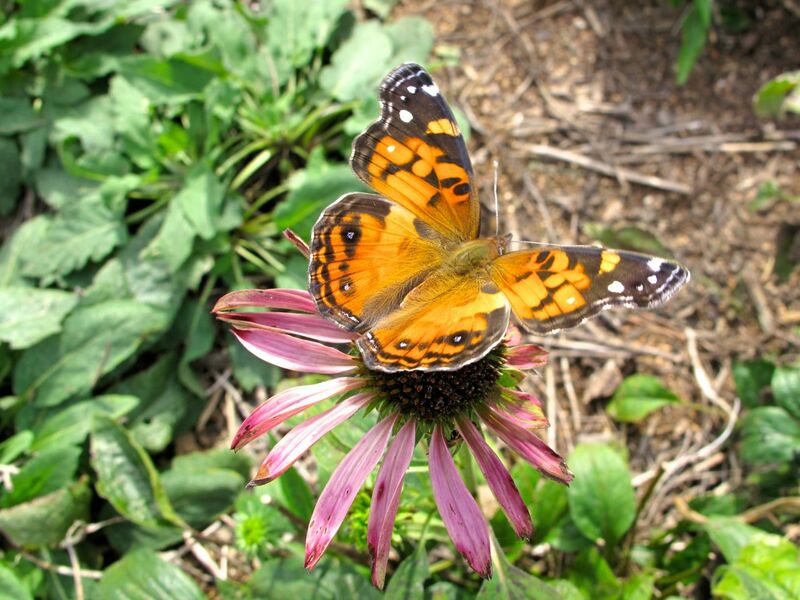 Despite the flowers’ ragged appearance American goldfinches were to them attracted anyway, as was this American Lady. This was the first time I had noticed this type of butterfly in the garden. 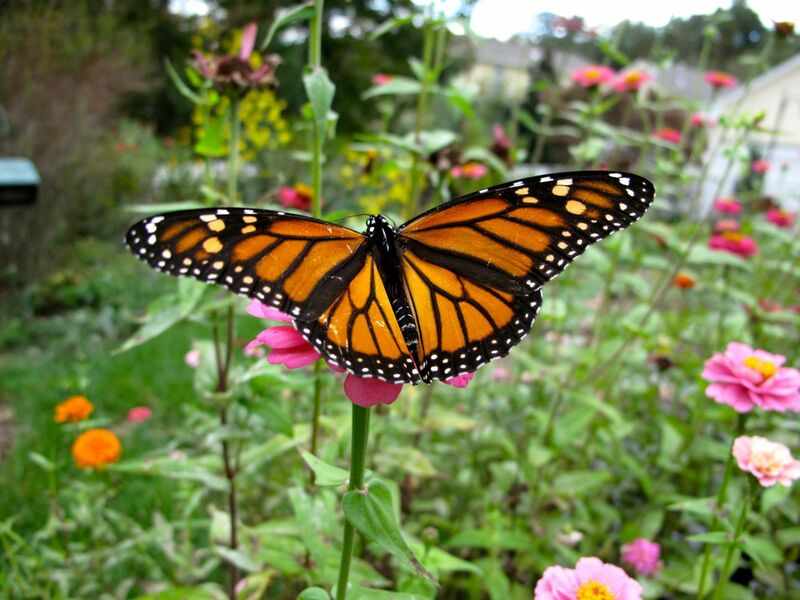 It was not a strong year for seeing butterflies. 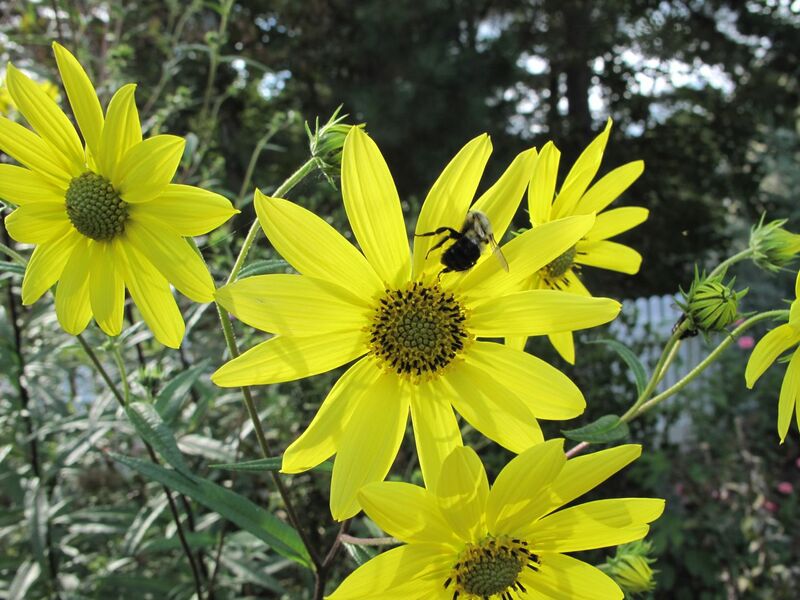 Native Helianthus angustifolius (Swamp Sunflower) reached over 10 feet tall before finally revealing its sunny color. 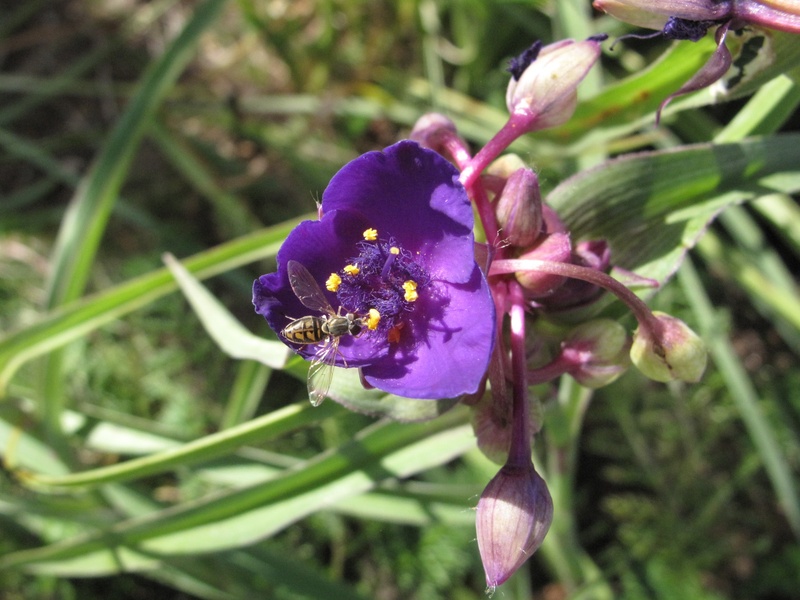 The bright yellow blooms attracted many pollinators and made the western border positively glow. 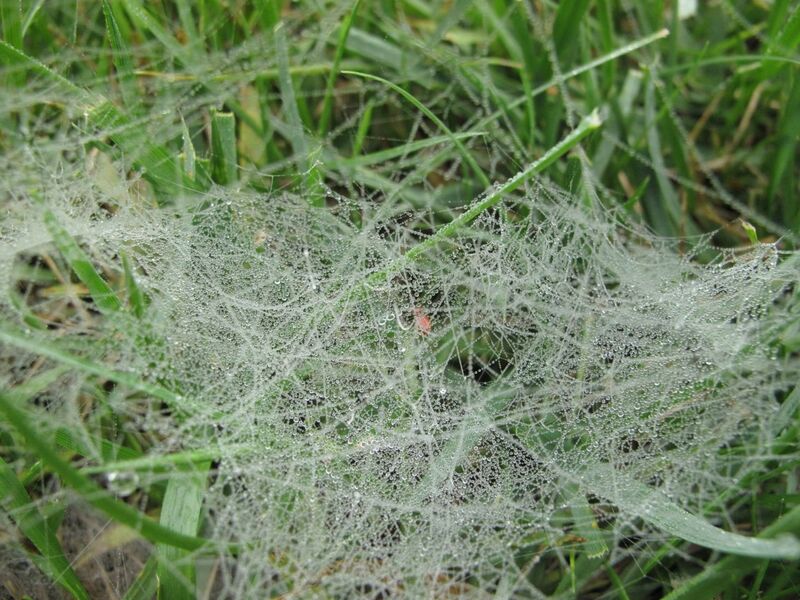 A heavy fog moved in the first morning of October and the lawn was covered with dozens of spiderwebs (Agelenopsis sp. (Grass Spider)). 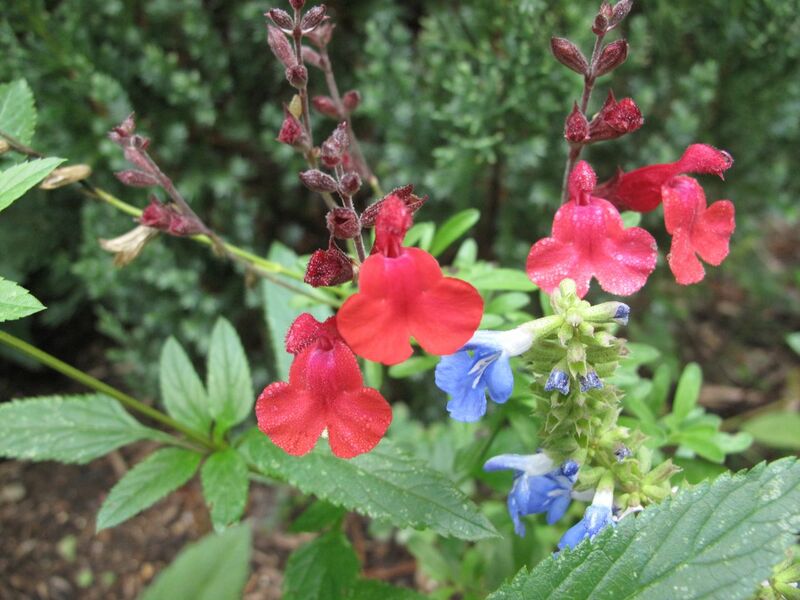 Salvia greggii ‘Furman’s Red’ (Autumn Sage), Cornus florida (Flowering Dogwood) and Hylotelephium telephium ‘Herbstfreude’ (Autumn Joy) added rich red hues to the garden. My favorite red this year was the Blue Bell Dahlia. I planted it in the Northern Border back against the fence, expecting it to be much taller than it actually was. It grew to about 3 feet tall. 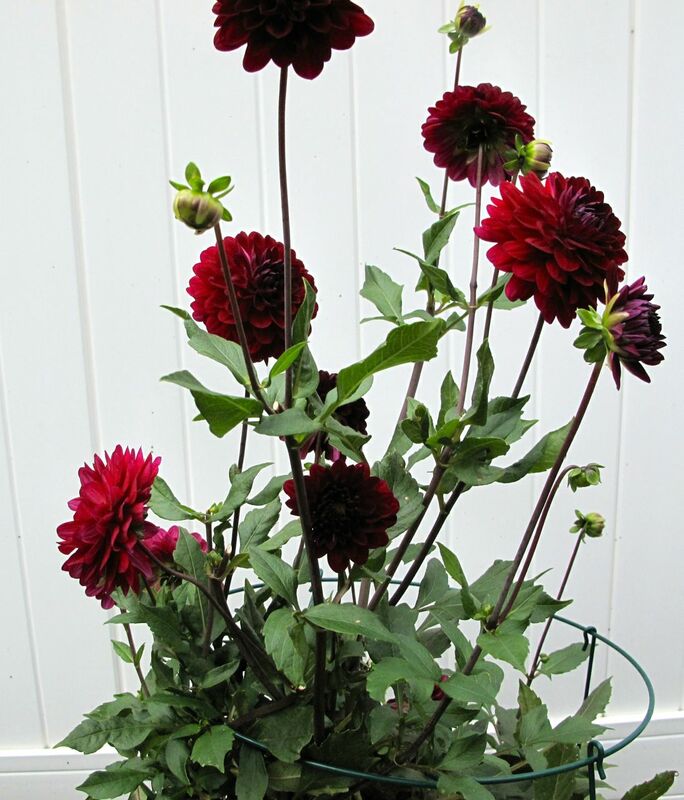 The dahlia’s dark red flower featured prominently in most of my In A Vase On Monday arrangements during October, including one that is my favorite from the whole year. Monarchs appeared in the garden during the second week of October and kept me chasing after them with my camera for days. 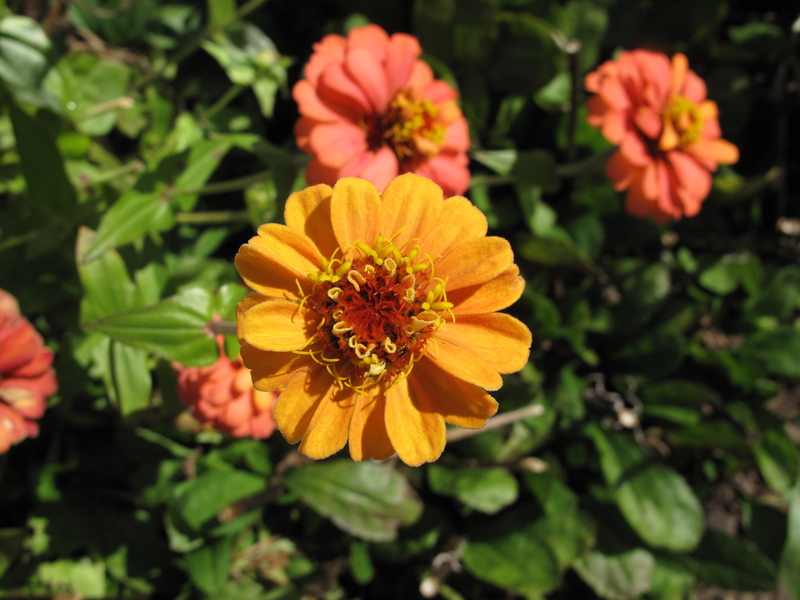 Lantana and Zinnias were their favorite nectaring plants as they loaded up to continue their fall migration. After many years of wanting to grow Spider Lilies as my grandmother had done, I finally ordered some bulbs and planted them this fall. When the foliage emerged I realized it will be next year before I see them bloom. 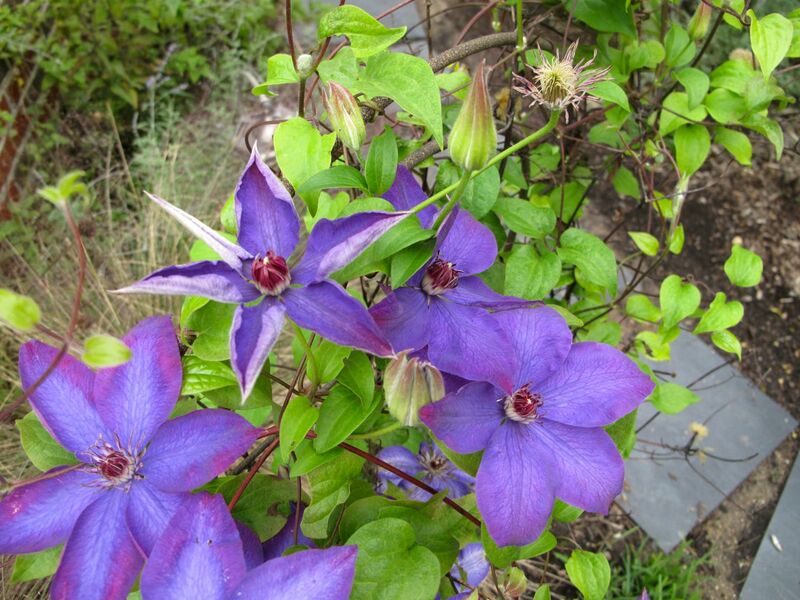 At mid-October I was pleased to see the Jackmanii Clematis flowering again in the narrow Southern Side Path along the side of the house. 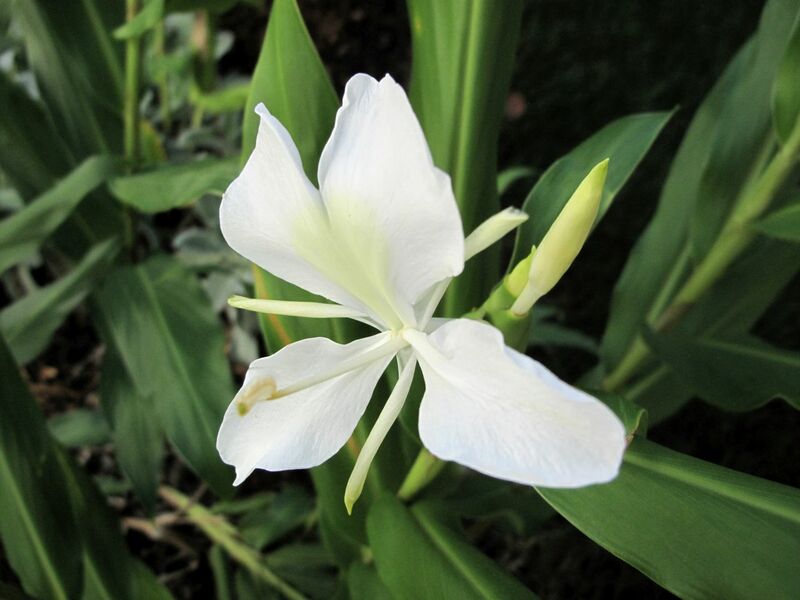 The fragrant Hedychium coronarium (Ginger lily) opened around this time, also located along the Southern Side Path. This year only a few flowers had time to fully develop before getting nipped by cold. 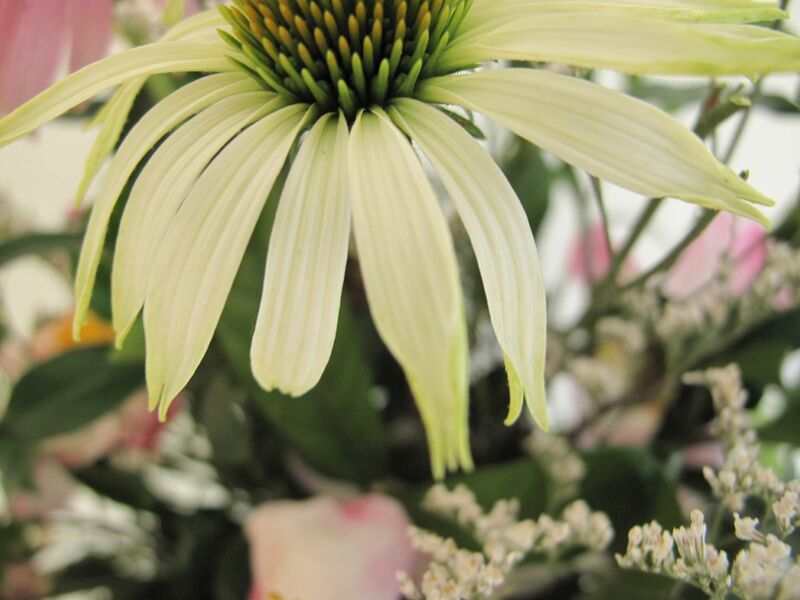 As the end of October arrived Echinacea purpurea ‘White Swan’ (Coneflower) rallied to produce a fresh display of pristine blossoms and a few blooms of Camellia sasanqua ‘Hana-Jiman’ appeared. Like the Hedychium, this highly scented camellia was a casualty of an early cold snap, but for a few days it looked nice outdoors and paired well with White Swan for an indoor arrangement. In the first days of November the autumnal colors of Helianthus angustifolius (Swamp Sunflower) were remarkable. 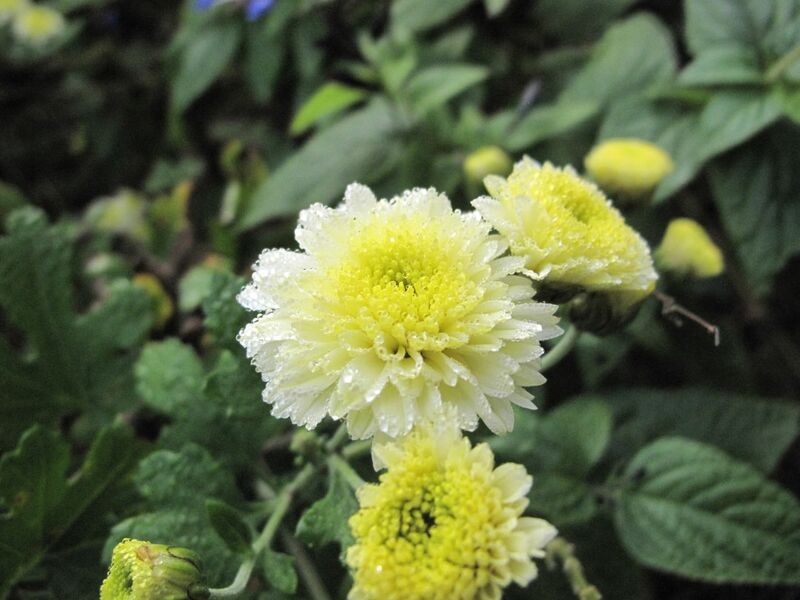 A passalong Chrysanthemum starting showing color mid-October and had come iinto full bloom the first week of November, just as the temperature fell slightly below freezing overnight for the first time this fall. 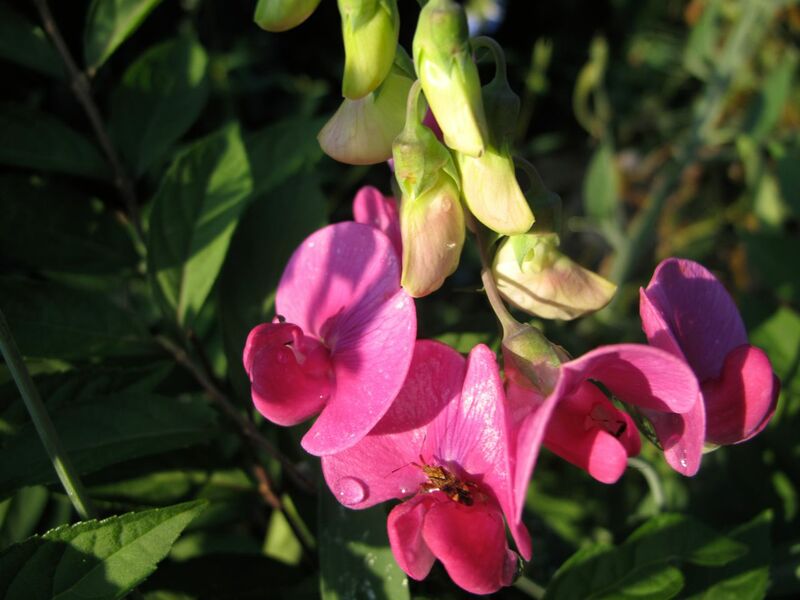 A bargain purchase of red Antirrhinum majus (Snapdragon) gave the meditation circle some much needed color. 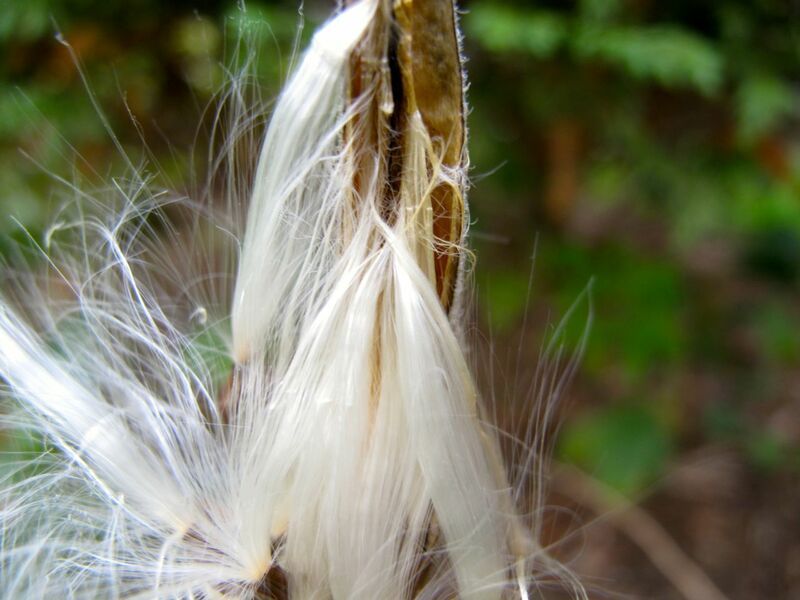 A few days later seed pods of asclepias tubersosa were fluffy and inviting. 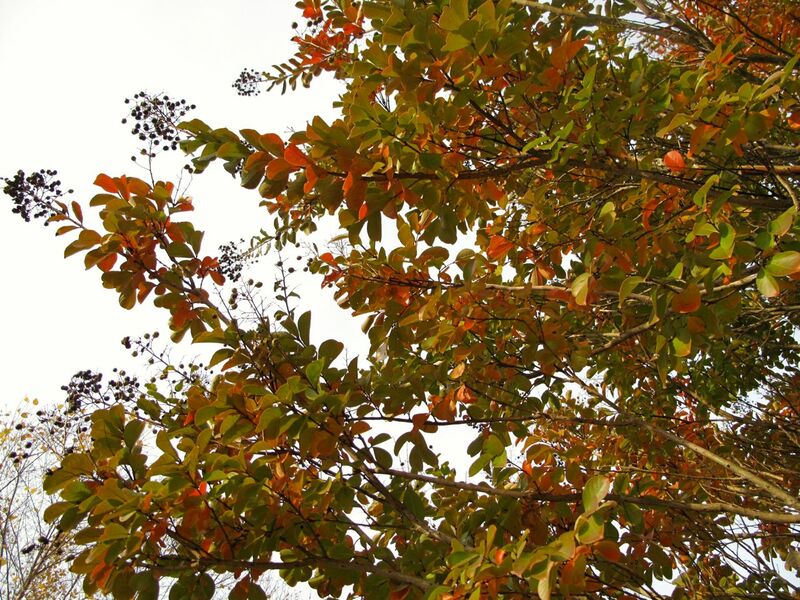 The pair of crape myrtles at the end of the front walkway were shifting from green to rich orange and golden hues. 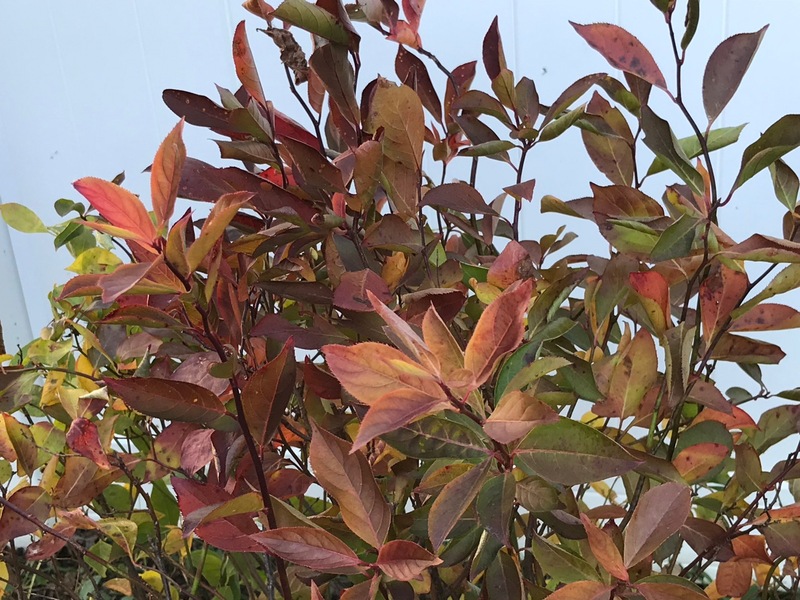 Using Crape Myrtle leaves as a beginning point, somehow I was able to find plants representing each season of the year to include in the “Four Seasons” vase on November 10. “Four Seasons” referred to the annual cycle in the garden and was my way of helping mark the first year anniversary for Cathy’s weekly challenge In A Vase On Monday. 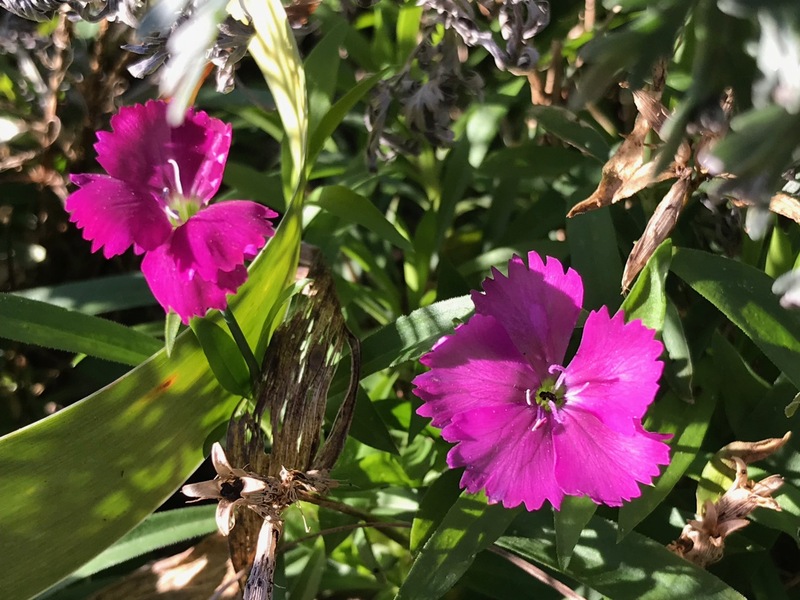 By the end of November the garden had settled in for a rest, while I began looking ahead to spring with dreams of hyacinths and Anemone coronaria. 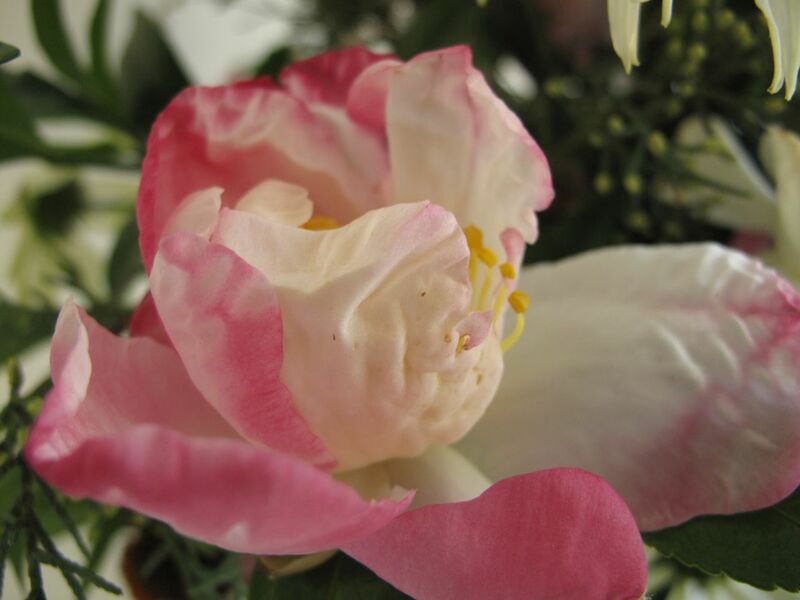 A big thanks to Cathy for hosting this 2014 garden retrospective. 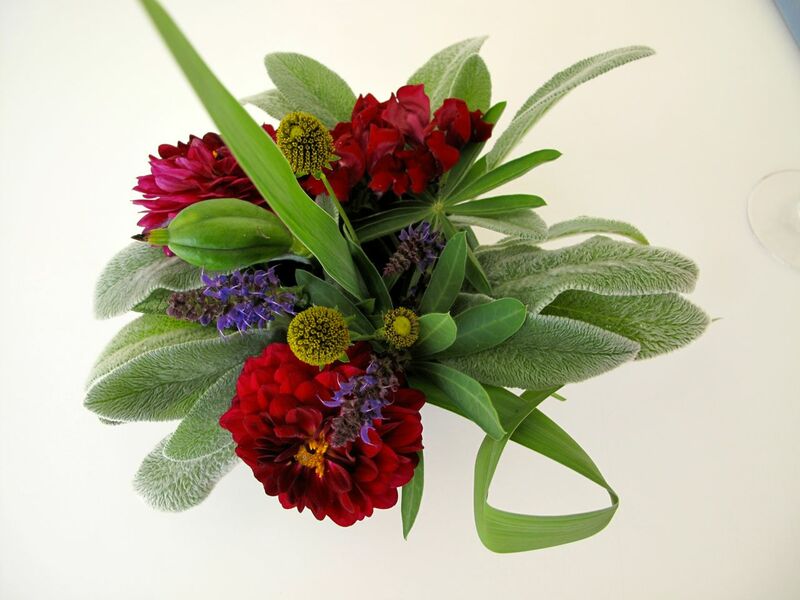 Visit Words and Herbs to see her own reviews along with links to those of other participating garden bloggers. 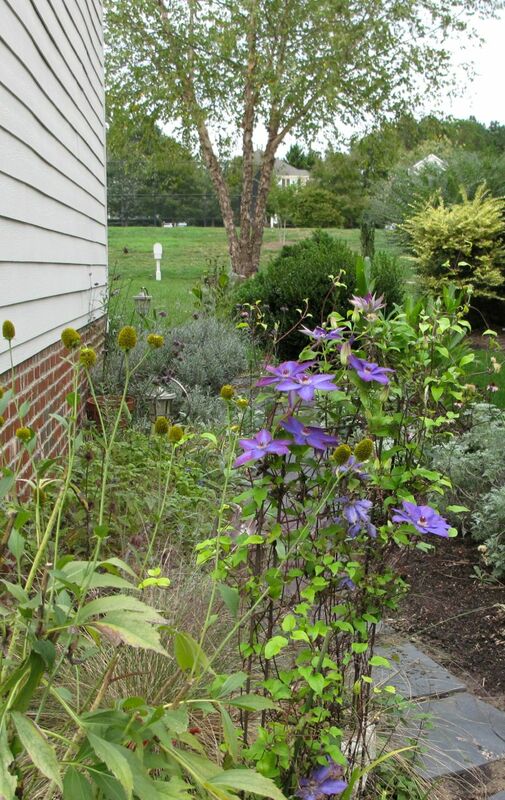 This entry was posted in garden and tagged echinacea, garden photography, late fall garden, late summer garden, meditation garden on December 16, 2014 by pbmgarden. Last year I ordered Anemone coronaria for spring delivery and they arrived very late from the inexpensive catalog company. Disappointingly, only one or two survived. Christina suggested a fall planting might work better so in early October I found a reputable source and placed an order with Brent and Becky’s Bulbs. By the time the box arrived last week I had forgotten about the order. It is so easy to surprise myself! 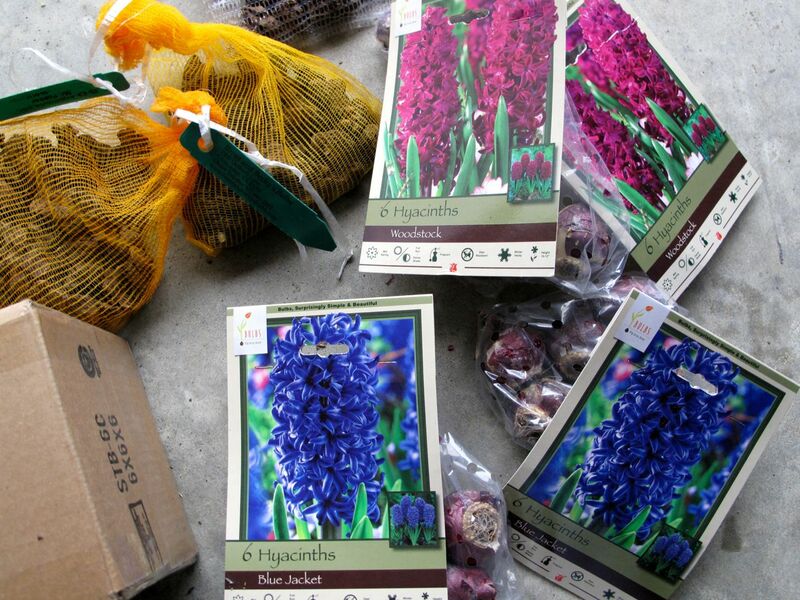 I also bought some richly colored hyacinth bulbs from a local garden center. The packaging is well-designed to appeal to customers like me, but this was not an impulse purchase. 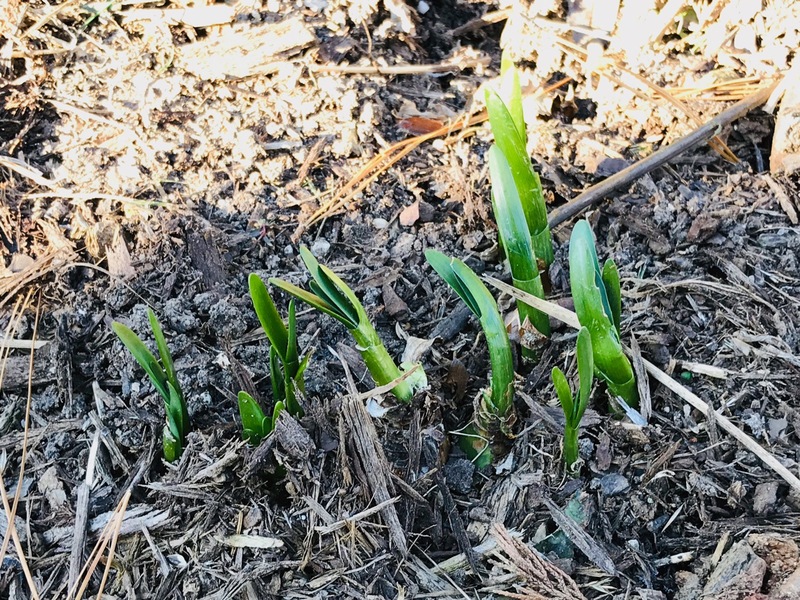 Each spring one or two hyacinths from a single package planted 13 years ago emerge to remind me I really should get more hyacinths. Finally I have listened. After a busy week with family visiting I thought today would be perfect for planting some spring bulbs, but the garden is waterlogged. Instead perhaps I should use the time to figure out where in the world I thought I would put these bulbs. 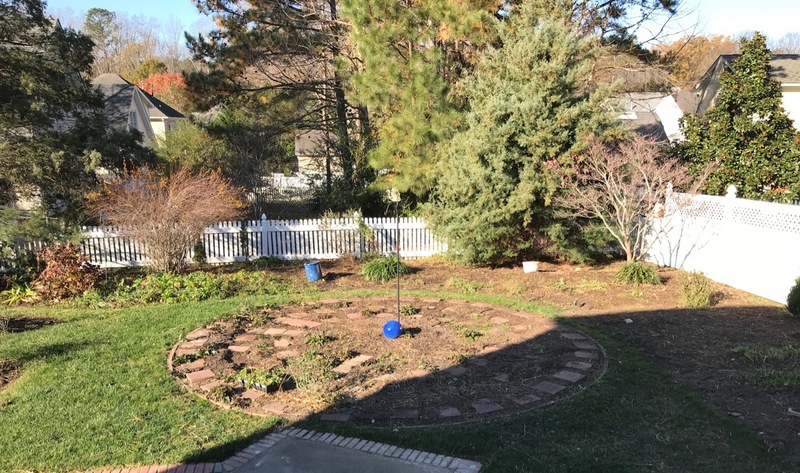 This entry was posted in garden and tagged Anemone coronaria, Hyacinth orientalis, late fall garden, meditation circle, spring bulbs on November 26, 2014 by pbmgarden.